The Austin HealthMate Junior Plus features all of the benefits of the HealthMate Series air cleaners, but with potassium-impregnated carbon blend (called Superblend) to give higher effectiveness rating in the removal of the formaldehyde family of gasses and ammonias - these chemicals are found in common household items such as new carpeting and pressed wood, and cigarette smoke. Like the HealthMate Series, the HealthMate Plus models feature a 4-stage filter system including 2 pre-filters, medical-grade HEPA, and activated carbon filtration to remove both airborne allergens and particles, and more than 250 hazardous/noxious vapors, gases, and fumes. 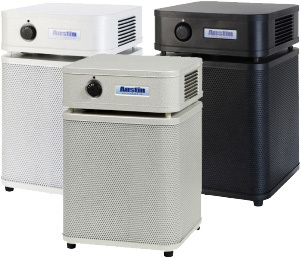 The Austin HealthMate's HEPA filter is capable of removing more than 99.97% of all particles greater than 0.3 microns in size and approximately 95% of particles down to 0.1 microns, making it ideal for the removal of pet dander, dust mites, pollen, mold spores, and other particulate contaminants. Recommended Application: The Austin HealthMate Junior Plus is an excellent choice for homeowners with chemical sensitivities or specific concerns about removing ammonia and formaldehyde gasses. The HealthMate Junior Plus offers medical-grade filtration for removal of common allergens and a wide range of chemical contaminants at an affordable price. Austin HealthMate HM200 JR PLUS are suitable for rooms up to 225 sq ft.